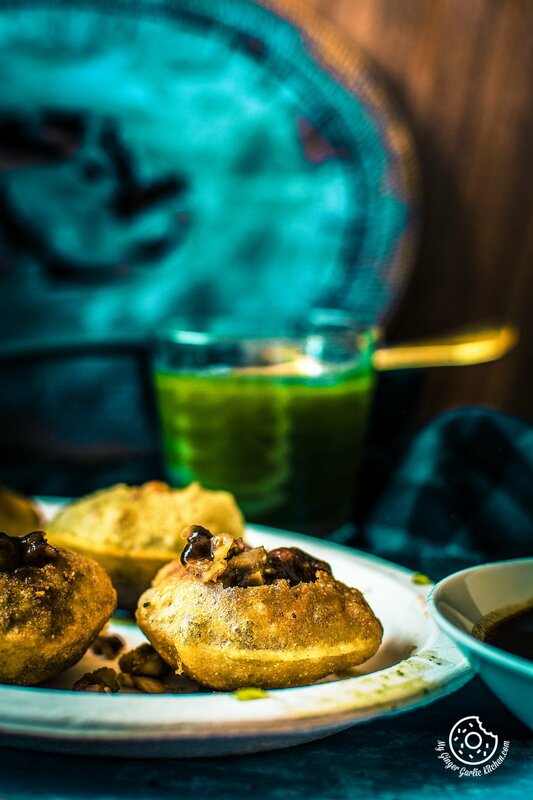 Learn How To Make Pani Puri Recipe | Gol Gappa Recipe with a simple video tutorial. 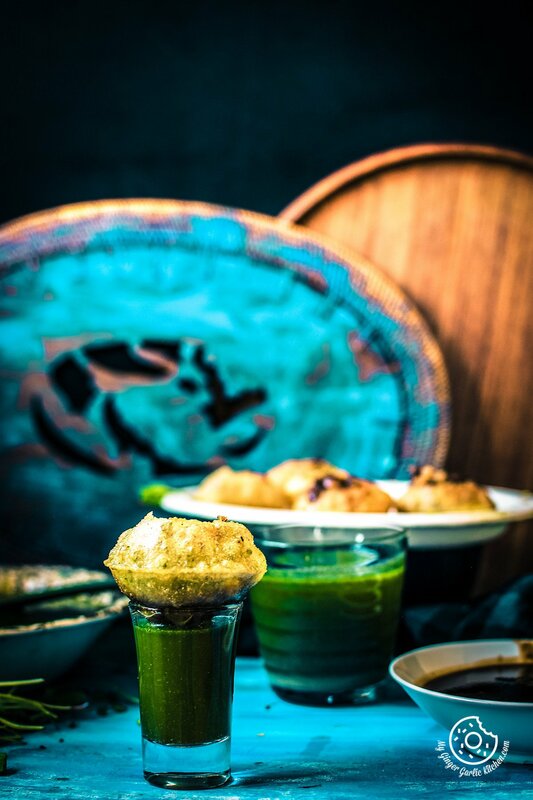 Pani puri is an incredible dish made with potato masala, onion and chickpeas masala, and tamarind chutney. These are crispy and crunchy hollow puris which are stuffed with various masalas and tamarind chutney. These puris are then drenched in sour and spicy Coriander Mint Flavored Water, aka Dhania Pudina Pani. What is Pani Puri / Gol Gappe? Gol Gappe or Pani Puri a very famous Indian street food which is served as a street snack in many states of the Indian subcontinent. In English, this can be understood as ‘Crispy Spicy Watery balls. For pani puri lovers this is a saintly word which does not need any introduction. But for those who are not aware of this divine thing, then there is a description is for you below. What are these? These are Fried Crisp and golden hollow puris made with semolina. 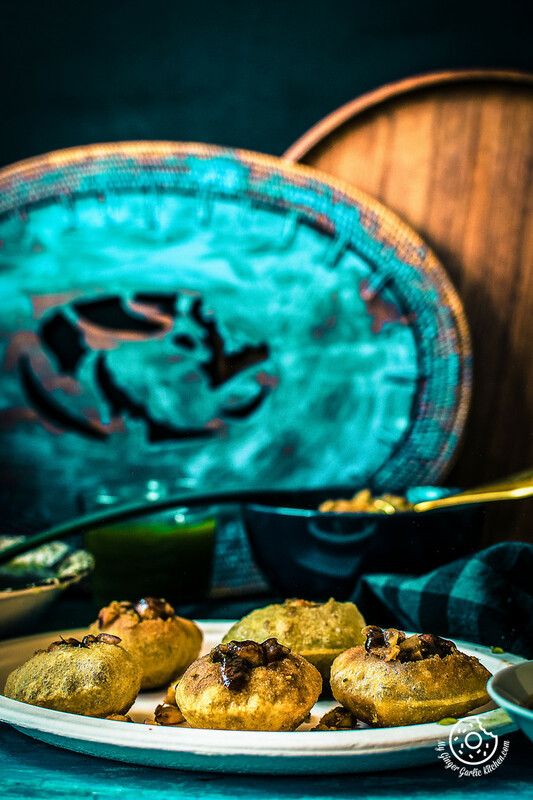 They are then stuffed with spicy boiled potatoes and chickpeas filling, topped with sweet and tangy tamarind chutney. And the final addition of chilled mint and coriander flavored spicy water is a thing to live for. 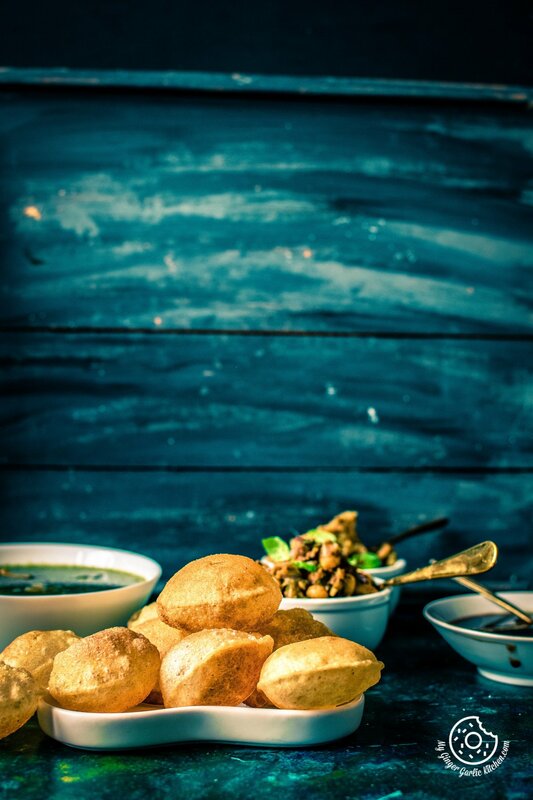 What is the best time to eat Pani Puri / Gol Gappe? For me, anytime is a great time for eating Pani Puri. Actually, I just can’t say no to this; not even when I am full — I will still taste one or two more. 😉 These make a great snack or brunch for any time of the year. And especially on a hot summer day, because it contains spicy chilled water. Summer or no summer, these tiny bundles of joy and spices always taste divine. What are the other names of Pani Puri? Pani Puri has several names such as gol gappa, pakodi, puchka, pani puri, etc. In the city of Mumbai, this street food is known as Pani Puri or Paanipuri. In the Northern part of India, they are known as Golgappa or Gol Gappe. They also have another name — Puchka / Poochkas in West Bengal. And Pani Patashi is a popular name in the states of Madhya Pradesh and Rajasthan. Gupchup is a known name in some parts of Odhisa or Gup Chup in some parts of Jharkhand and Chhattisgarh. In the state of Uttar Pradesh, this dish is known as “Pani Ke Bataashe, or Pani Batashe”, which means a crispy ball containing spicy water. How do you assemble Pani Puri? It is very simple to assemble if you are using readymade puris. First, you poke a crispy sphere (puri, bataasha, gappa) with a thumb or index finger. And then you add a small amount of filling inside it and then you top it with some chutney. This crispy sphere (puri, bataasha, gappa) then is dipped in the spicy water or Pani. How is pani puri filling made? 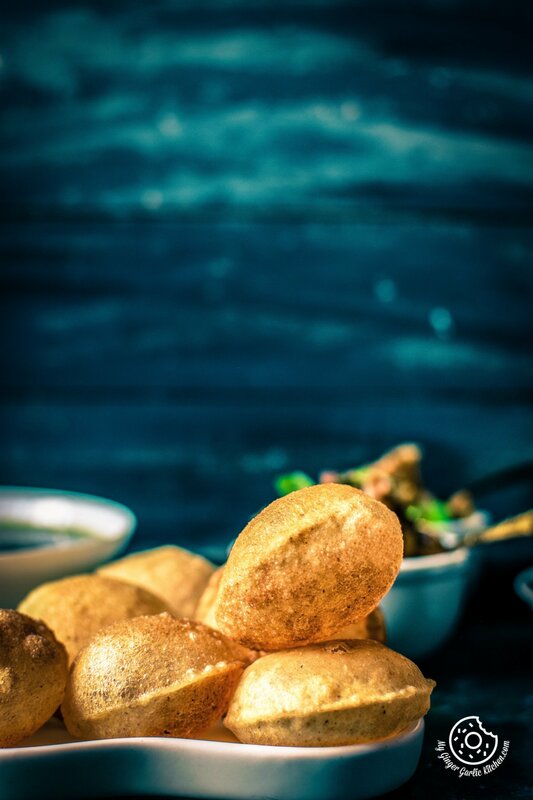 The basic Panipuri / Golgappa filling is made by mashing boiled and peeled potatoes with black salt, salt, cumin powder, chili powder, and amchoor powder. However, this filling is different in different parts of the country. In some parts, tamarind pulp is added to the filling. In other parts, mint and coriander paste is added. At other places, black chickpeas are added to the potato filling. Some street vendors known as ‘pani puri wallahs’, like to add boiled chickpeas to the potato filling. Some prefer to add onions while others don’t. So this pani puri stuffing is all about personal taste. Some like it really spicy; others like it mild. Some like to add sweet and tart tamarind chutney, while others like to only add sour curd / yogurt aka dahi. How many types of fillings are available? Aaloo (potato) and black chana aka desi chana filling. Aloo (potato) and chickpeas filling. Aloo (potato) and moong sprouts filling. Aaloo (potato) and boondi (chickpea flour, fried puffed balls) filling. 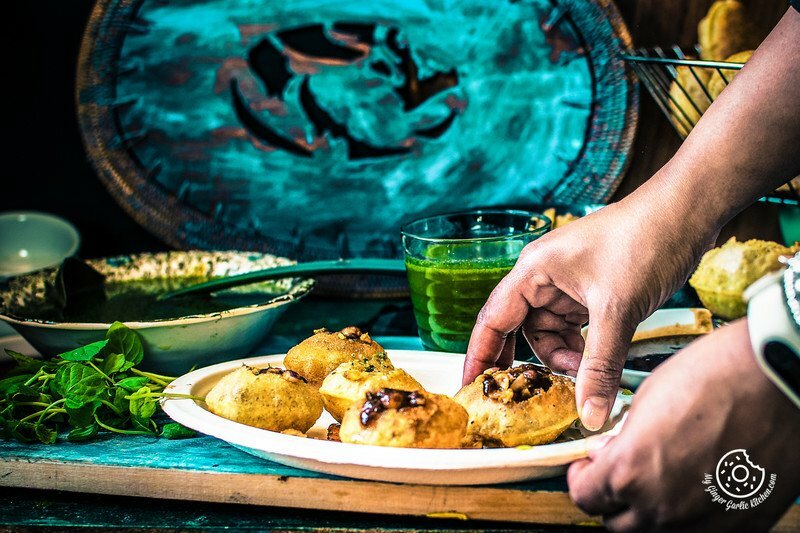 How easy is it to make pani puri at home? Making a simple dhania pudina wala pani or any other flavored pani is so easy. And aloo masala filling and other fillings are also very easy to make at home. 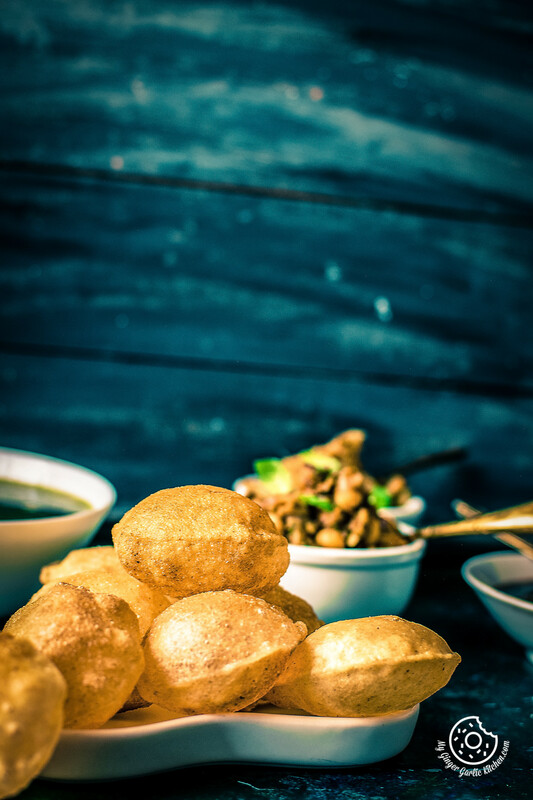 Making panipuri at home is not only a hygienic and healthier way of savoring it, but it also allows you to customize it according to your taste buds. These also make a great party snack. If you want to ‘wow’ your guests, then make it for get-togethers, and parties. Assembling pani puri and playing with different flavors is so much fun. So you just arrange everything and let everyone assemble their own pani puri according to their own taste. 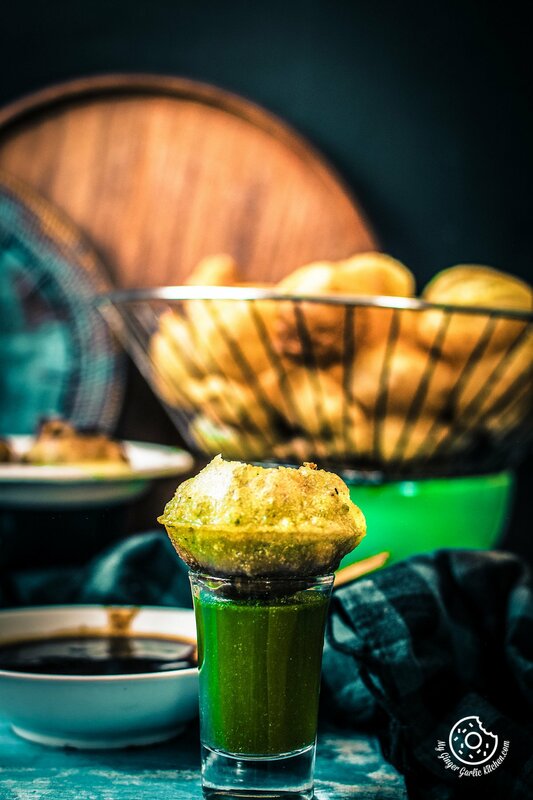 How to make Gol Gappa / Pani Puri at home? Gappe or Puri is usually made with suji / semolina, and wheat flour or all purpose flour. Making street style crispy and puffed puris at home is not so tough. You just need some practice and a little patience. But if you want to use readymade puffed puris, then you can simply use the store bought ones which are easily available at any Indian grocery store. How many types of flavored water is used for making pani puri? Imli Ka Pani, where tamarind is added to the spicy water. Pudine Ka Pani / Mint Flavoured Water: Fresh mint leaves and green chilly paste is added to the water along with basic spices such as, black pepper powder, black salt, and chaat masala. This fresh minty water gives a refreshing taste to Pani Puri. Hing Imli Ka Pani: This ‘Hing Imli Pani’ or ‘hing wala pani’ is made by mixing hing (asafoetida), imli (tamarind), water, and some spices. This adds a distinct flavour to pani puri. Hing ka Pani, where asafetida / hing is added to the basic spicy water. Then there is Nimbu Ka Pani, where lemon juice is added to the water. There is also Pudine ka pani, where mint paste is added to the spicy water. Jeera Water / Jeere Ka Pani / Cumin Flavoured Water: Jeera Pani aka cumin water is made using is a mixture of roasted cumin seeds, black salt, chaat masala, lemon. This all is then added to the chilled water. Lahsun Pani/ Garlic Pani: Garlic powder is added to the water along with rock salt, red chilli powder, salt, coriander, citric acid, and asafoetida. This delicious water adds a distinct lahsuni / lehsuni flavour to the Pani Puri. Adrak Pani / Ginger Pani: This pani is made with ginger paste or powder, hing, black salt, and water. Kacche Aam ka Pani / Raw Mango Water: You boil raw mangoes in water. Then this is blended into a smooth paste along with green chilies and ginger. This paste is added to the water along with some spices and chopped raw mangoes. Guava water / Amrood Ka Pani: The sweet and juicy guava is blended with grounded mint leaves, green chilies, ginger, and some water. This paste is added to the water with some essential spices. Amchur Ka Pani: Here Amchur powder is added with black pepper, cumin powder, jaggery powder, and salt to the water. Coriander Mint Pani / Dhaniya aur Pudina Ka Paani: Mint and coriander leaves are blended with green chilies, and ginger. And this paste of dhaniya pudina leaves is added to the water with some basic spices used for making spicy pani. Meetha Pani or Khajur Ka Pani: Tamarind and dates chutney is added to the mildly spicy chilled water. Vodka Pani: This is a great option for booze lovers. Vodka is added to spicy tangy water. 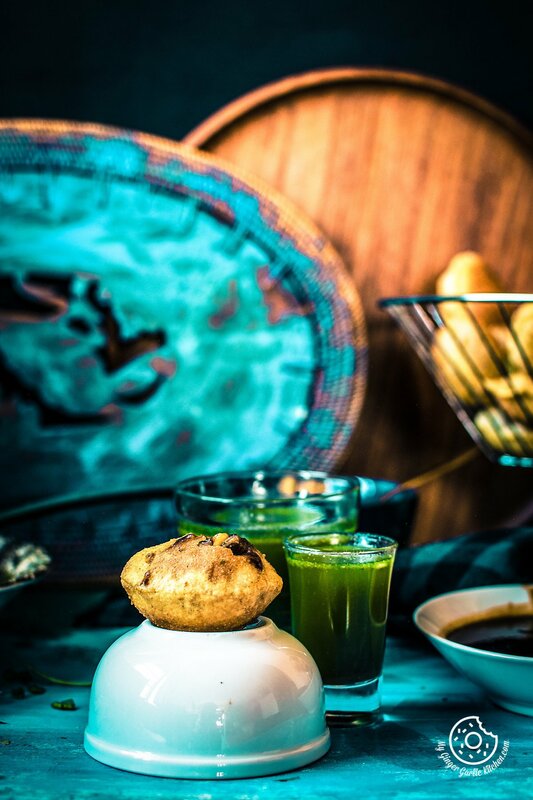 Vodka pani puri is not served on streets often, but it is quite common in some restaurants these days. I have made two fillings in this recipe — one is basic potato filling, and the other is chickpeas onion filling. You can either use both fillings, or just one filling of your choice. For chickpeas filling, I have used white chickpeas, but you can also use black chickpeas. I have added tamarind chutney, but if you want it spicier, then you can add some mint coriander chutney. I did not add any fried boondi to dhania pudina water, but you can surely add it if you like. I have added onions to chickpeas filling, but you can skip that. Make everything in advance, and let the water chill in the refrigerator. This process will better release the flavours of spices into the water. Take it out only when you want to assemble it. Always store the puris in an air-tight container. 1. Add in the suji, maida, atta, salt and baking soda to a mixing bowl. Mix thoroughly. 3. Cover this dough with damp cloth and set aside for 30 mins. 4. Divide dough into 4 portions and roll them into balls. 5. Take one portion of dough and cover rest of the balls with a damp cloth. 6. Dust a working surface with some dry flour. 7. Using a rolling pin roll out a thin almost translucent circle. 8. Cut it using a round cookie cutter/glass/lid. We need all equal sized small circles. 9. Arrange them on a plate and cover with a damp cloth. Repeat the steps 7-9. 10. Heat oil in a pan or kadhai to very high. (It should be hot but not smoky). 11. Now drop these puris into hot oil and press them in the center and on the edges using a spatula or ladle, this will puff up the puris. 12. Reduce the heat and fry them until golden. 13. Drain the puris out from the oil using a strain ladle and place on a tissue paper. 14. Let them cool completely. Repeat the steps from 10-14. 15. Then store in an airtight container and use when required. 1. Put a handful of coriander leaves, mint leaves, green chilies, ginger, tamarind water, and 4 tablespoons ice cold water into a blending jar. 2. Blend it well to make a smooth paste. 3. Pass it through a strainer in a big mixing bowl. 4. Add in the 5 cups of ice cold water and stir well. 5. Add salt to taste, 1 teaspoon black salt, 1 teaspoon roasted cumin powder, 1 teaspoon chaat masala, ½ teaspoon red chili powder, 1 tablespoon amchoor powder, 1/4 teaspoon black pepper powder and mix well. (you can adjust spices according to your taste). 6. Pani is ready, let it chill for 30 minutes. 1. In a mixing bowl, add the boiled and mashed potatoes. 2. Add in the Red Chili Powder, Roasted Cumin Powder, Salt, Amchoor Powder and mix well. 4. Aloo (Potato) Masala Stuffing is ready. 1. In a mixing bowl, add the boiled chickpeas. 4. Mash this filling slightly between the two spoons. 5. Chickpeas Masala Stuffing is ready. 1. Mash soaked tamarind using hands to make a pulp. 2. Strain it with soup strainer. 3. Add this tamarind pulp to a saucepan and heat it over medium heat. 4. Add jaggery and stir well. 5. Boil for 5 minutes. 6. Add 1 teaspoon amchoor powder, black pepper powder, red chili powder, roasted Cumin powder, and black salt. 7. Mix well and boil for 2-3 minutes over medium heat. 8. Add salt and mix well. Let it boil for 3-4 minutes. This chutney should be a little thin as it thickens after cooling down. 9. This chutney can be refrigerated in a sterilized jar for up to three months. 1. Poke each puri using a thumb or index finger. 2. Add 1 teaspoon of the boiled potato filling in the puri. 3. Add 1 teaspoon of chickpeas filling in the puri. 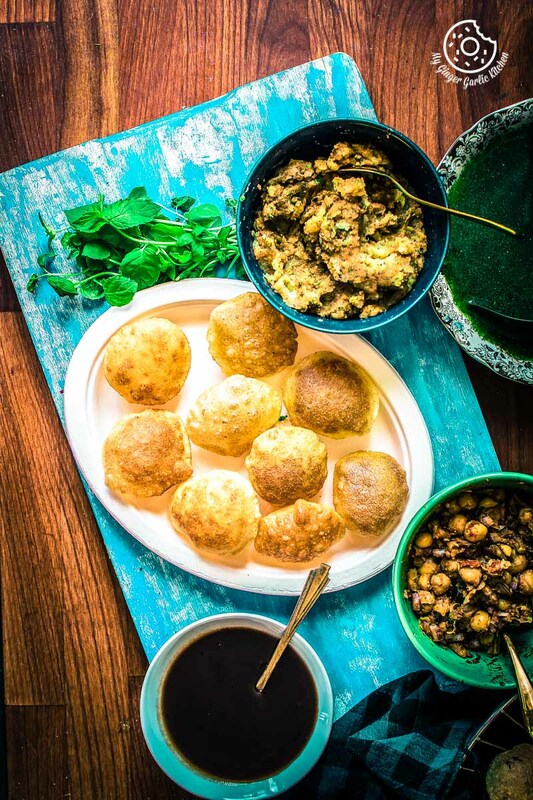 4. drizzle each puri with some tamarind chutney. 5. Stir the green dhania pudina pani first and then pour it in the puri. 6. 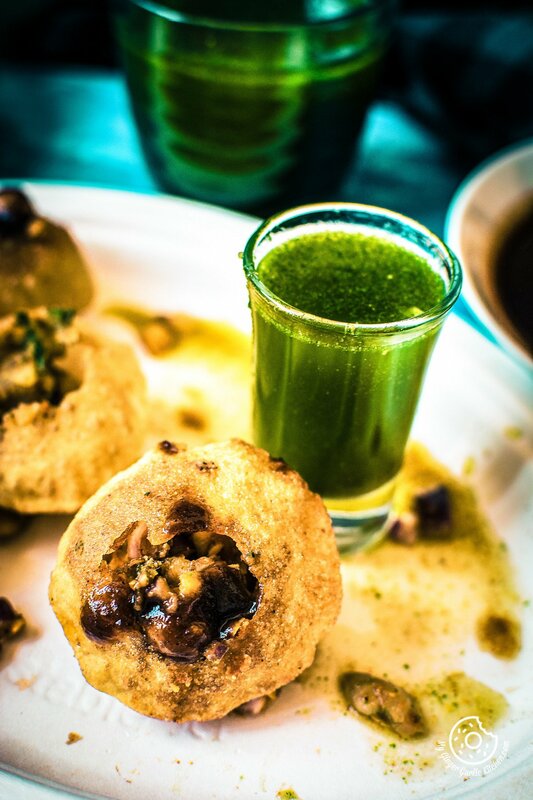 Serve the pani puri immediately.